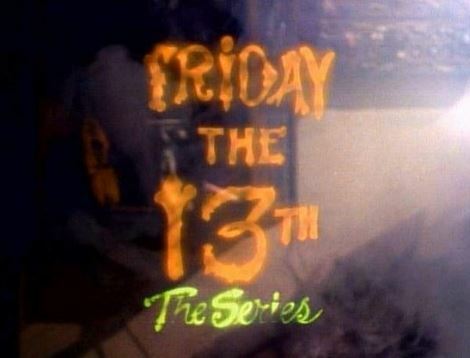 We’re watching Friday the 13th… on Friday the 13th! 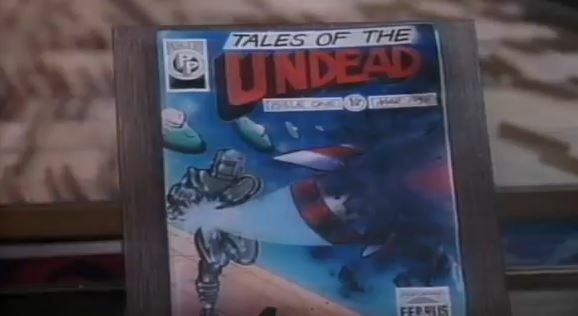 And episode ten is the comic book episode, “Tales of the Undead,” so the show’s talking my language. Not bagged and boarded? Shame. 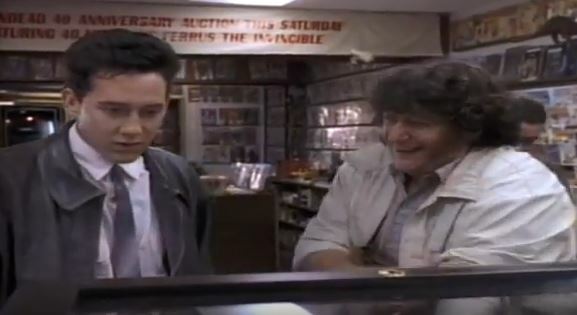 On Ryan’s weekly visit to the comic book store, the local comic book guy (pre-dating the one from The Simpsons by several years) shows off a rare, valuable comic on display, Tales of the Undead #1, the first appearance of Ryan’s favorite superhero Ferrus the Invincible. Some creepy thug then steals the comic, which brings Ferrus to life. 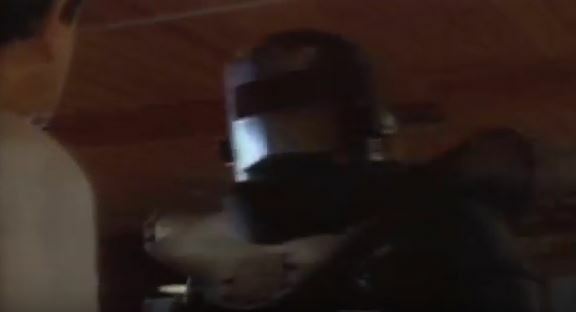 Ferrus (an Iron Man type) trashes the store and kills the comic book guy. Just go ahead and make all your own Simpsons Comic Book Guy quotes without me. Ryan tracks the comic back to its former owner, Jay Star, the artist who created Ferrus back in the 1940s. He says others took his creation and made millions from it, leaving him with nothing. We then follow Star as he tracks down the thug and tries to take back the comic. The thug transforms into Ferrus, but Star kills Ferrus with a lightbolt-shaped award he owns. Star then proceeds to use Ferrus and take revenge on the rich publishers who screwed him over back in the day. When the show is smart: Star’s real name is Jacob Starinksi, a reference to comic book artist Jack Kirby, who was born Jacob Kurtzberg. The episode references all the old-school comic creators whose work was taken from them by publishers. 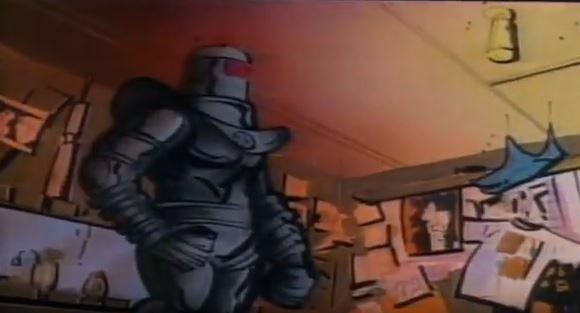 When the show is cheesy: The gimmick is that transformation scenes are depicted via a series of comic book panels on screen. One could argue that the artwork isn’t the best. 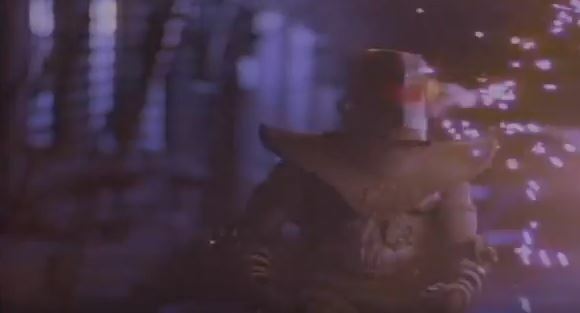 Similarly, I go back and forth on whether the Ferrus robot costume is cool or goofy. – Jack doesn’t appear in this episode. We’re told he’s in Singapore, but we’re not told why. Was he in search of yet another antique from the store? Back in the vault: A fun episode, more an old-timey monster movie than it is a slasher. All the comic book takes for some great novelty as well. Remember that in 1987, it was extremely rare to have superheroes/comics on screen, so we had to take what we got. Next: If I only had a brain.